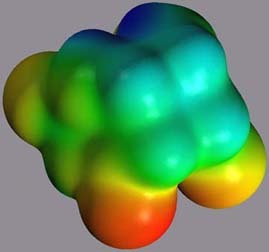 As anticipated from the topological differences in the HOMO and LUMO of 1, the geometric and electronic structure of 1*- shows several interesting differences and similarities to 1 and 1*+. 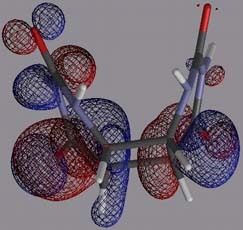 As shown in Figure 9, the cyclobutane ring is planarized in 1*-, and the overall structure is almost symmetrical. However, the charge is localized on one of the carbonyl functions in the 4-position, stabilizing the radical anion as a ketyl radical anion. In this conformation, the ketyl radical anion could potentially be stabilized by an interaction of the SOMO with the pi* orbital of the C4' carbonyl. Assuming a binding mode as described above, this charge localization would increase the putative interaction of the C4 carbonyl and a polar group in the ative site and lower the reduction potential of 1. Similar interactions have been described in model systems. 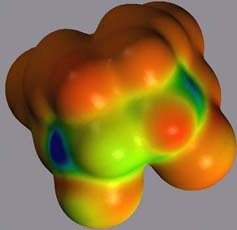 The electrostatic potential in the cyclobutyl moiety is very little affected by the reductive electron transfer and the partial charges are almost identical to the ones in neutral 1. Figure 10 left shows the spin density, projected onto an isodensity surface of 1*-. In agreement with the localized negative charge discussed above, the spin density in 1*- is mostly localized at C4, but extends also towards the C5-C5' bond. Unlike the corresponding C6-C6' bond in 1*+ , this bond is only negligibly stretched since the additional electron resides mostly in the pi* orbital of the carbonyl function.